All Print Management Partners envelopes are designed and engineered for trouble free operation on every brand of machine inserter. You spend a lot of money on equipment to automate the insertion process, don't let poor quality envelopes reduce these efficiencies. 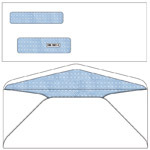 This is our most popular standard flap envelope for customers inserting checks. This envelope is a hybrid size called a # 9 1/2 because it is the width of a #10 but the height of a #9. The extra width insures easy insertion while the reduced height minimizes "show through" of confidential information. This #10 double window is our #1 selling standard flap envelope. Time and again, it has proven the solution when other vendor's envelopes didn't get the job done. For those using a single window and a preprinted return address, this is the solution for you. Custom printed envelopes are printed quickly and at a great price! Our vast experience with inserters and inserter friendly envelopes means we can custom produce any envelope size or window position you need; using the same window and production dies that have proven themselves over the past 15 years!